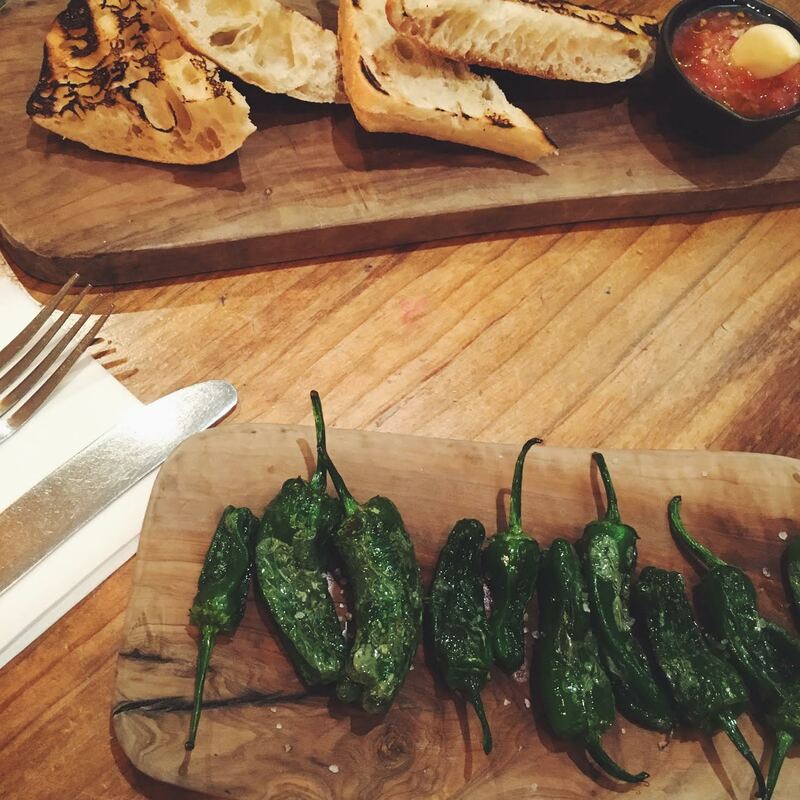 Tapas is one type of food that is relatively difficult to find executed well in London. Maybe that's because much of it's taste, quality and in a way magic lies in the way the ingredients behind it are sourced, the fish caught fresh from the Med sea before they expertly prepared on the spot rather than having to travel across the channel in a semi frozen state, or maybe it is because too many English tourists in their time have sampled some rather bad examples of "Spanish" food whilst on a package holiday to Mallorca, drowning their tastebuds in a sea of bland aioli, deep fried prawns and chunky chips devoured by the poolside and with that destroying any future interest in tapas. In any case I've not really had much luck finding decent tapas in London bar a few notable exceptions that sadly do not happen to be close to me geographically and also aren't particularly cheap, José Pizzaro's south of the river London dining spots José and Pizarro of a Michelin star extraordinary calibre but not somewhere I would regularly venture to especially on a casual Sunday night and on a budget. Lucky for me then that a friend eventually dragged me to La Farola on Upper Street, located in what is probably my favourite London neighbourhood of Angel. I've walked past this rather cosy looking and Mediterranean leaning space many times, usually after my cup of coffee and Sunday paper reading catch up at my favourite coffee shop just down the road and could never stop myself from catching a glimpse of the fresh seafood platters and pitchers of sangria appearing from the kitchen and onto the tables here, getting more intrigued every time if things tasted as good as they looked here. I am happy to report then that this was very much the case when I finally managed to make the trip to La Farola for dinner. Yes, the food here will never be as good as tapas you'll find at a family run local joint in Barcelona or Madrid or any tiny picturesque Spanish village but it was nonetheless pretty damn tasty and also very decently priced which for anything involving seafood is far from a given in London. Order the classics here- we loved the aioli that rather than a stodgy mayo cast-off was instead a dreamy, garlicky and creamy marriage of flavours that we kept on reordering so quickly did we scoop it up and which was served alongside some classic patatas bravas. 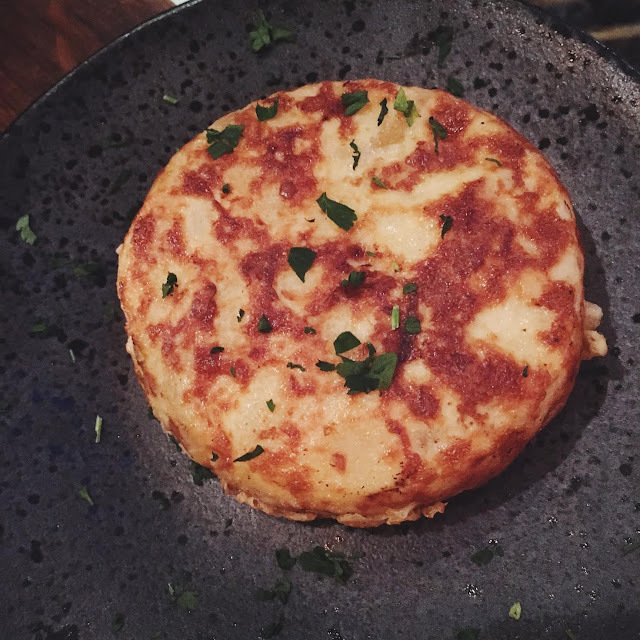 The tortilla again ticked all the boxes, expertly prepared and seasoned, it oozed with egg yolk in all the right places and showcased a kitchen that knows how to do authentic Spanish cooking. 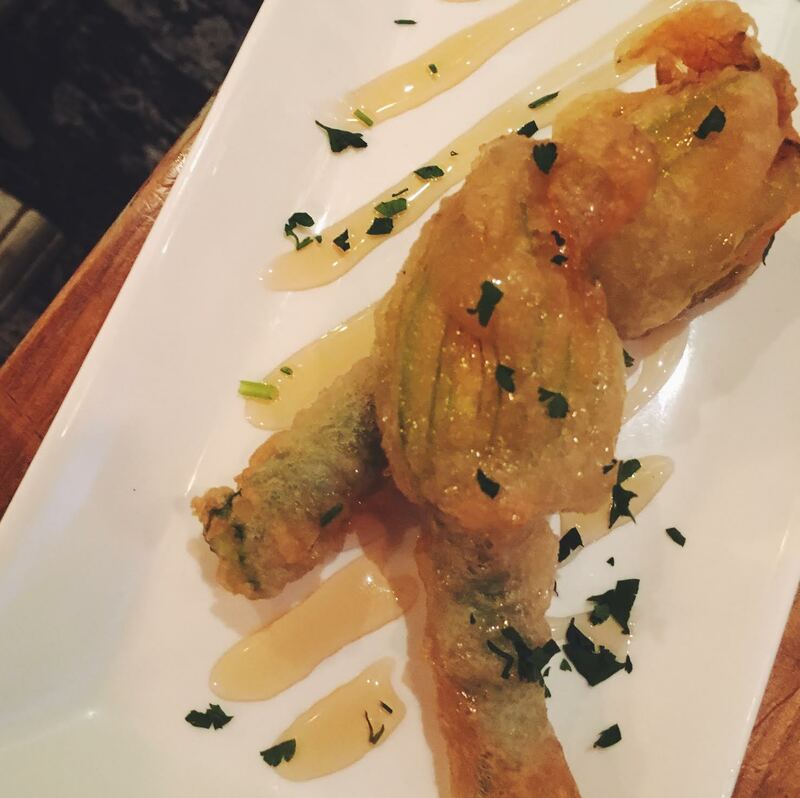 Jumbo red prawns in garlic and chilli were messy but all the better for it and our start of the show for the evening, a dish of deep fried courgette flower drizzled with honey and filled with goats cheese was on par with anything similar I have tried and was wowed by in Barcelona. Service was also incredibly friendly and forthcoming with our waitress making sure we ordered just enough to try as many different flavours as possible between the two of us without having to break the bank. I can see why La Farola has stood it's ground on this restaurant filled street for a good few years now because it does what it sets out to do very well. It's not gimmicky or chasing the next gastronomic trend - if you want decent Spanish food in East London go here, you won't regret it. I absolutely adore Mexican food but much like good tapas it is far from easy to find in London. I actually had another review planned for an amazing taqueria I stumbled across in Shoreditch called Santo Remedio but before I even had a chance of writing it up this great little spot was sadly forced to close which means that despite some rumours of a few new Mexican restaurants opening in London next year, there really isn't much choice when it comes to this type of cuisine especially if you are looking for a little more than your bog standard and for me slightly bland Tex Mex and burrito type offering. 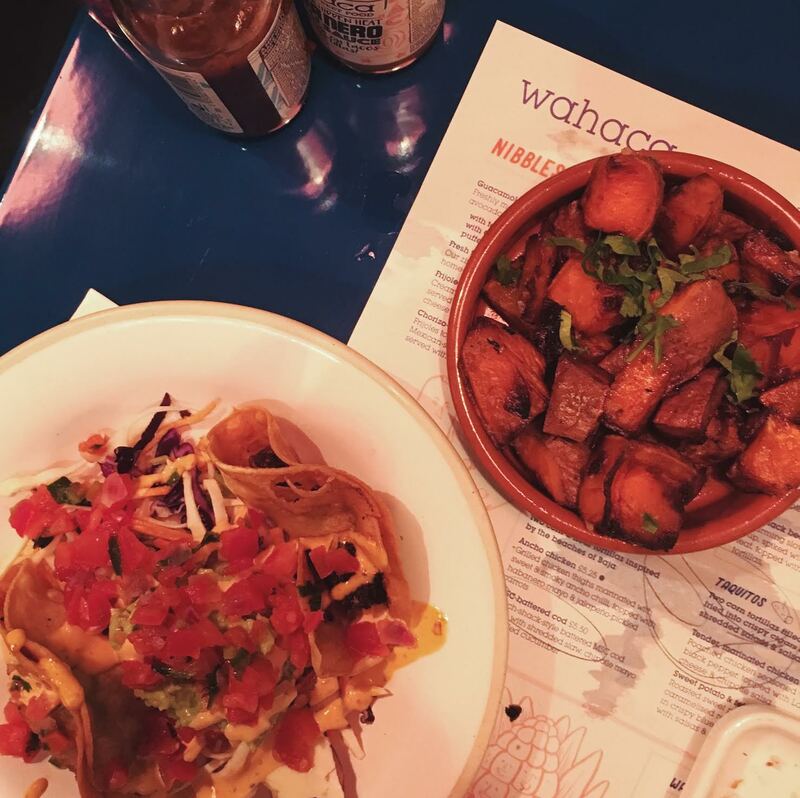 That said there is one place that has never failed to satisfy my Mexican cravings with it's fresh, tasty and flavourful food and that is Wahaca. Yes, I know what you are going to say it is a bit of a chain now and you will find hordes of tourists in certain branches (do not dine at the Covent Garden branch if you can avoid it) but hand on my heart alongside Nando's and Wagamama's, two in my eyes equally great chains I'd happily eat at once in a while, I don't really have one bad word to say about Wahaca. 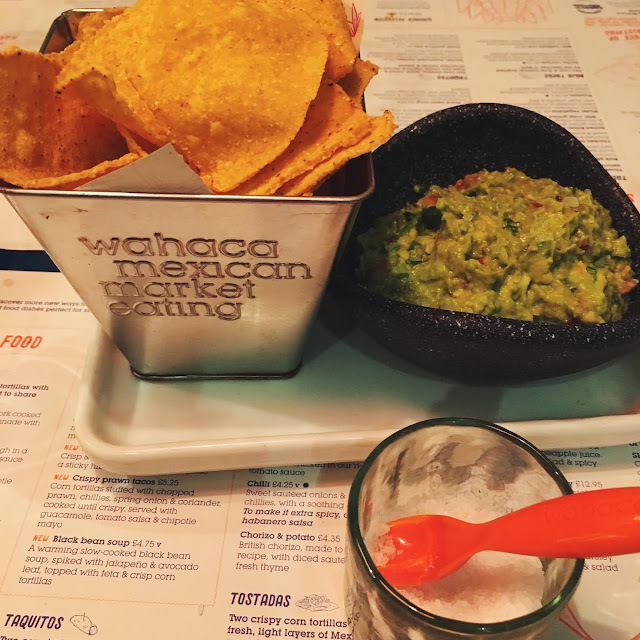 I've in fact been going there since Thomasina Meyer, Wahaca's founder and incidentally also a former Masterchef winner, opened the doors of her first branch during my uni days and am yet to experience a bad meal. I love the concept of ordering lots of little plates and experiencing as many flavours as possible in one sitting and Wahaca's menu is designed to accommodate exactly this type of dining. 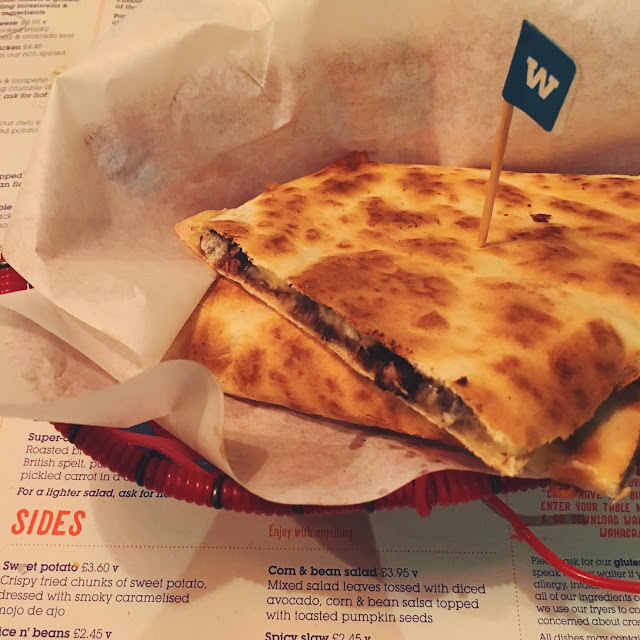 Whether you are a veggie, eat fish only like me or like your tender pulled pork - every type of Mexican small plate served here whether it is a taco, quesadilla or tostada will come with a version that is suited to you. Of course the menu leans a little towards being "anglicised" but not to the point where it feels unauthentic, more indeed using seasonal British ingredients to compliment the dishes that Thomisina brings back from her regular trips to Mexico. My favourites on a recent visit were the incredible baja battered cod tacos with chipotle mayo and slaw, classic black bean quesadillas oozing with cheese and the super addictive and moorish crispy fried sweet potato chunks dressed with smoky mojo de ajo that are served as a side. In my eyes Wahaca is one of the most affordable restaurants in London (we had more than enough food between the two of us and a caraffe of wine for under £25 a head) that also happens to serve some seriously tasty food. Yes, I've had some more mind blowing Mexican fare whilst in New York like at Salvation Taco but until that culinary movement comes over here we should count ourselves as very lucky to call this a chain many of us are actually able to dine at regularly, it indeed a UK wide success for a reason that has not lost in quality by expanding. Another week and another Ubereats discovery. After more than a few lacklustre experiences ordering Thai food from various restaurants with promising menus that sadly ended up being bland and cold once delivered to my door (not naming names of course) I stumbled across this diamond of a Thai restaurant on one of my duvet Saturdays when leaving the house was simply no option. 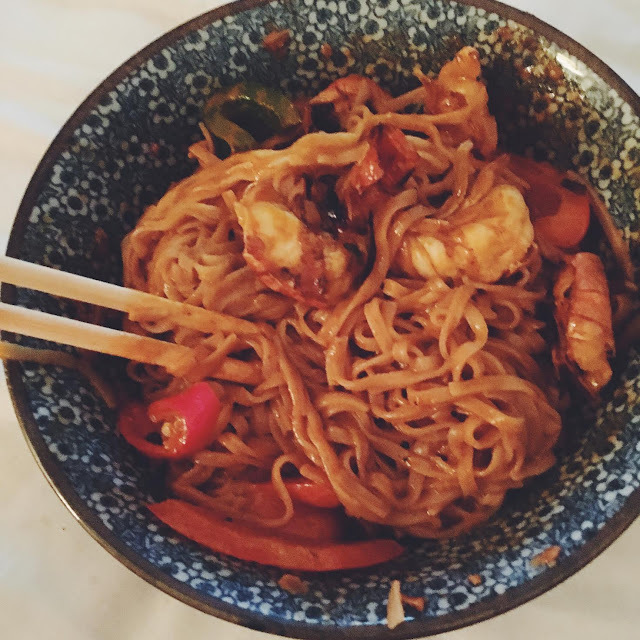 Everything I've tried, and that is quite a bit of their menu by now, is super authentic, beautifully seasoned and comes in big portions that will breath life into even the most hungover of people. My special recommendations has to be the absolutely incredible king prawn Cho Chee Curry, a thick red curry finished of with the juiciest of king prawns left in their shell for extra flavour, a dish that absolutely blew my mind when I first sampled it and that has been my to go to takeaway dish ever since and will be for some time to come. Gclub Guidelines for playing online casino with many players to play as a gambling game that generates income for every player. Day in a short time. The gamblers are comfortable when they come to play casino games with our online casino. Through the computer screen, Ipone, iPad, mobile phone, notebook for the player to play a simple gambling game. No matter who can play our gambling games all the time, you gambler. If you are one of those who want to earn extra money for yourself at your own home during your free time on the web, we are one more choice for you to try out. We then experimented with our gambling games. You are more fun but also you have extra income every day. However, anyone who wants to play gambling games on the web, we offer invitations to touch live 24 hours a day.